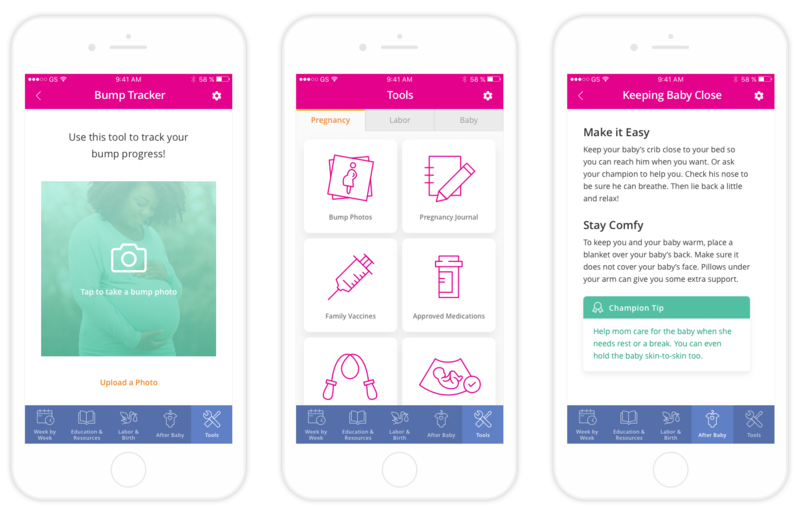 Helpful tools and trustworthy information provided by one of the nation’s largest women’s hospitals wrapped up into a sleek, easy-to-use app for first-time moms. Woman’s Hospital is one of the largest delivery service hospitals in the country and is esteemed as the “go-to” hospital for pregnancy and prenatal care in the South Louisiana region. For years, Woman’s Hospital had provided expectant mothers with a paper packet of information regarding hospital resources available throughout their pregnancy. This was eventually expanded into a thick, spiral-bound reference book and journal that served to educate patients while allowing them to document their pregnancy and important health information. The problem was, this was in 2015, and very few moms were carrying around a physical book, much less referencing it and writing down information. Almost all of the Woman’s Hospital patients got their information and kept track of pregnancy related information elsewhere—their smartphones. For years, Woman’s had provided expectant mothers with a paper packet of information regarding hospital resources available throughout their pregnancy. This was eventually expanded into a thick, spiral-bound reference book and journal that served to educate patients while allowing them to document their pregnancy and important health information. The problem was, this was in 2015, and very few moms were carrying around a physical book, much less referencing it and writing down information. Almost all of the Woman’s patients got their information and kept track of pregnancy related informations elsewhere—their smartphones. Probably the first and last time the paper journal was looked at. 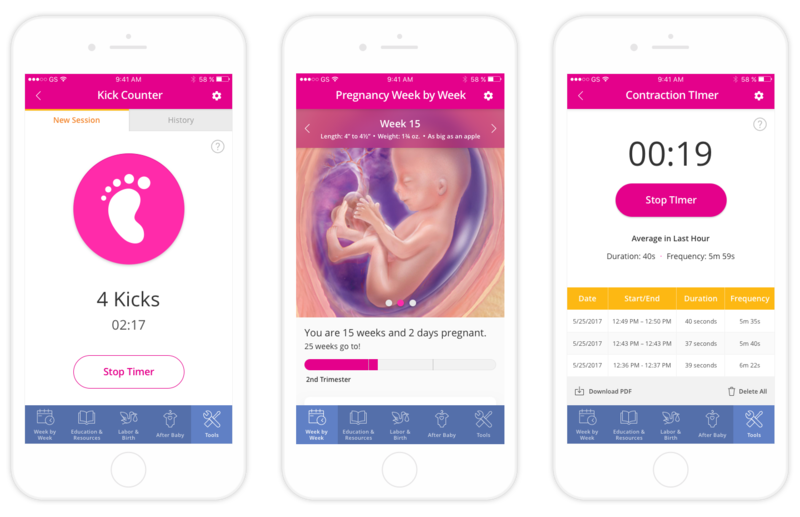 In order to achieve their vision of being a national leader through innovation, Woman's Hospital sought to convert their 250-page pregnancy journal into a comprehensive mobile app for their patients that would include educational material as well as interactive tools to use during a patient’s pregnancy and labor, as well as the first several months after birth. Additionally, it would provide hospital-specific information such as upcoming classes and events, maps and directories, and hospital policies and protocols. 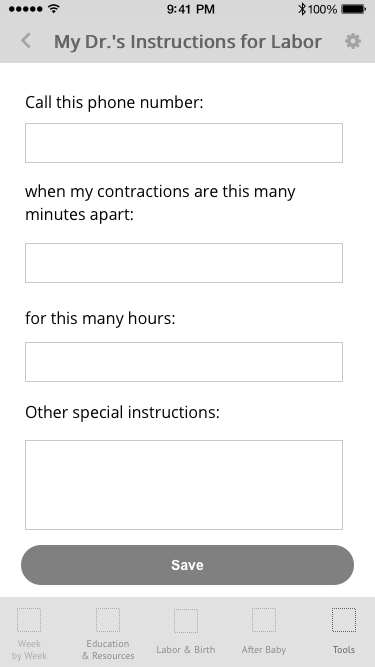 In order to achieve their vision of being a national leader through innovation, Woman's sought to convert their 250-page pregnancy journal into a comprehensive mobile app for their patients that would include educational material as well as interactive tools to use during a patient’s pregnancy and labor, as well as the first several months after birth. Additionally, it would provide hospital-specific information such as upcoming classes and events, maps and directories, and hospital policies and protocols. A few women mentioned the need for a weekly to-do list and information on what to expect during weekly doctor's appointments. A few women mentioned the need for a weekly to-do list and information on what to expect during weekly Dr. appointments. 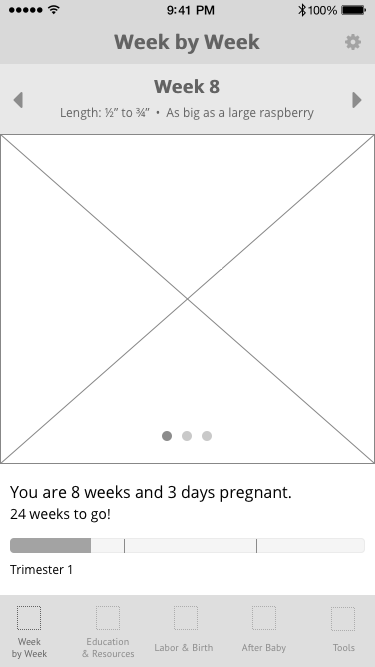 "I mostly used [existing pregnancy app] during my pregnancy. I liked the visuals of it, but it could've had more detailed info. 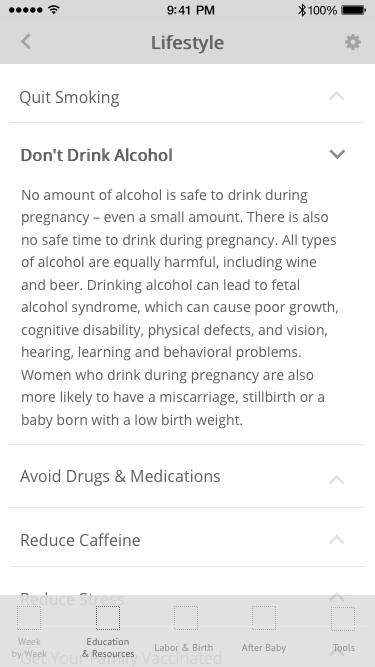 I would check [another existing pregnancy app] sometimes if I wanted more info." "I found myself wanting more information on what to expect at the different weekly doctor appointments. It would have been nice to have felt more prepared going in." 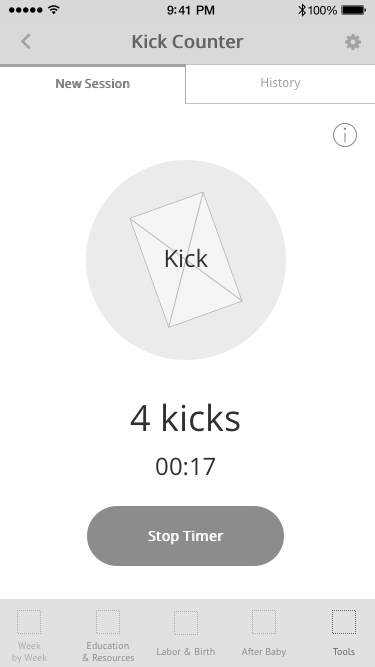 "I think it would be nice if one of the apps included a fetal kick counter and/or contractions timer. 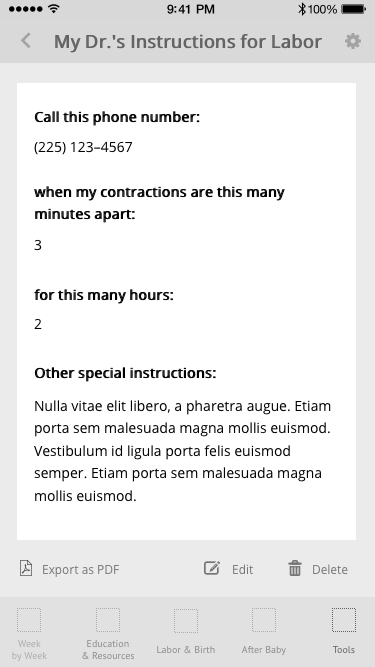 I had to download a separate app to time my contractions once I was in labor." I began with the existing content from the printed journal, and gradually separated the content into 5 main categories: Pregnancy Week by Week, Education, Labor & Birth, After Baby, and Tools. Attention was paid to how to move users throughout the app and connect them to pertinent tools within various content sections. As you can see, this app has a LOT of content and functionality. 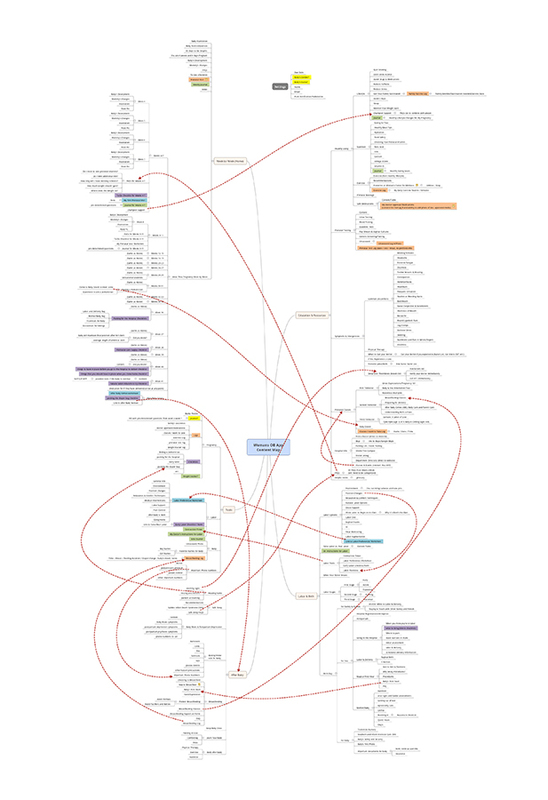 We had the content map printed and it was nearly as tall as me! As you can see, this app has a LOT of content and funcitonality. 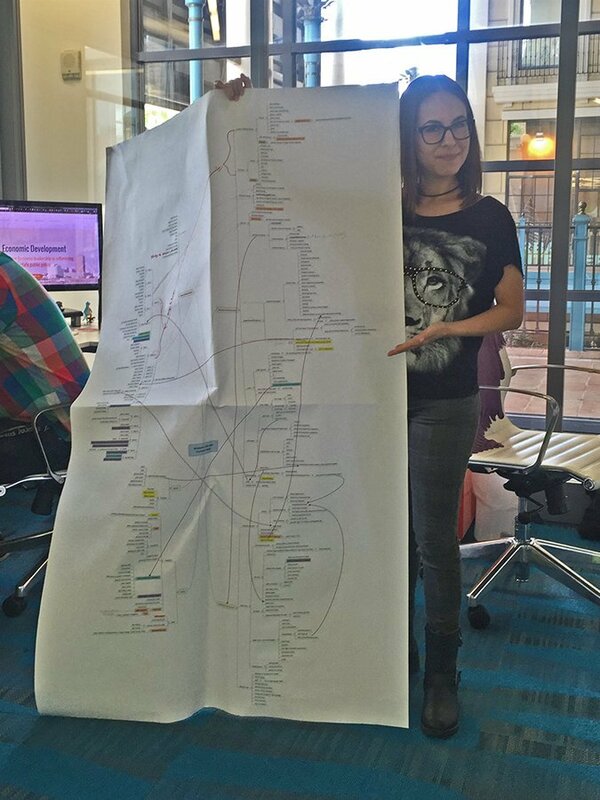 We had the content map printed and it was nearly as tall as me! 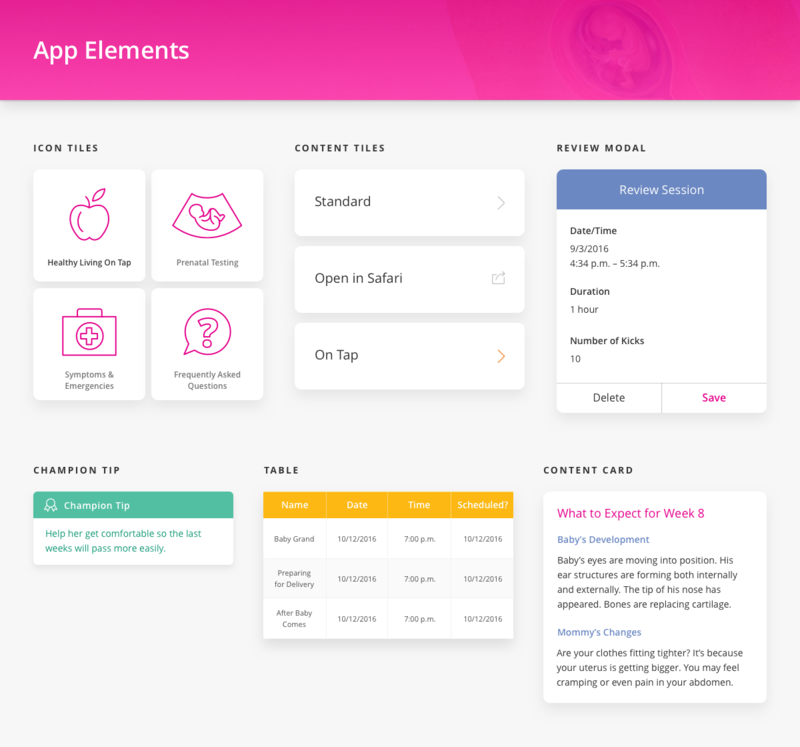 Using atomic design principles, I created elements that would be repeatable across the app in order to create consistency and user-recognition of content types. 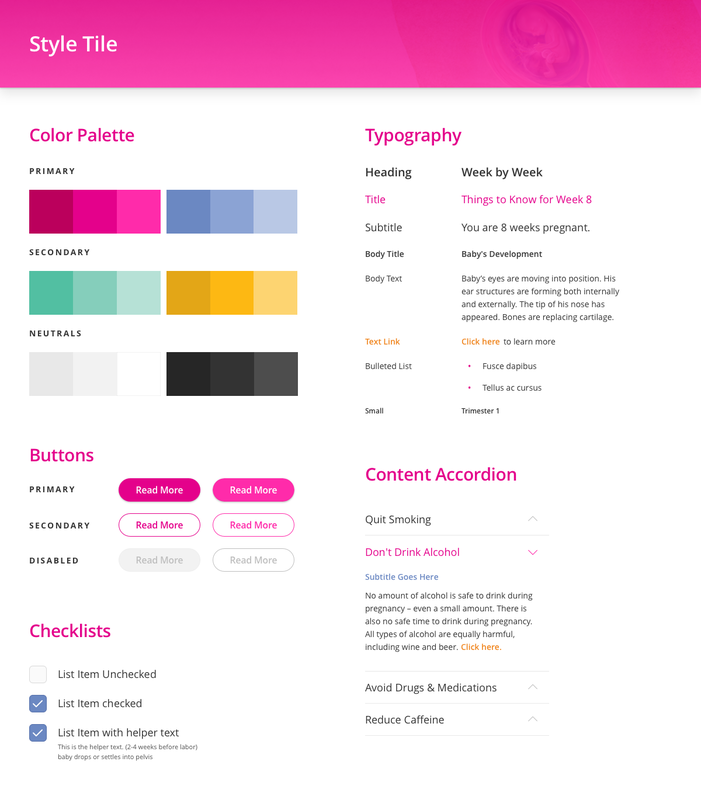 Using atomic design principles, I sought to create elements that would be repeatable across the app in order to create consistency and user-recognition of content types. I adhered to the Woman’s Hospital branding standards while expanding upon them for use in their first ever mobile app environment. 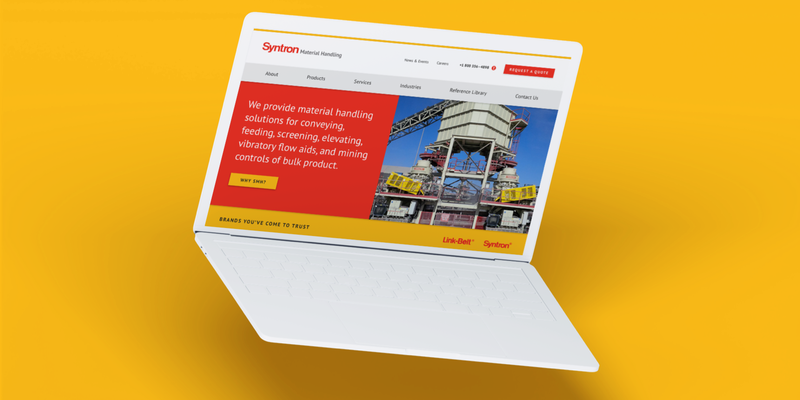 My focus for the visual design was to enhance the functionality and not let it get in the way of finding information quickly. A minimal primary color palette and thoughtful use of secondary colors throughout the app served only to assist the user in navigating the app and provide visual cues for different content types. I also designed a suite of icons for all content and tool areas of the app. 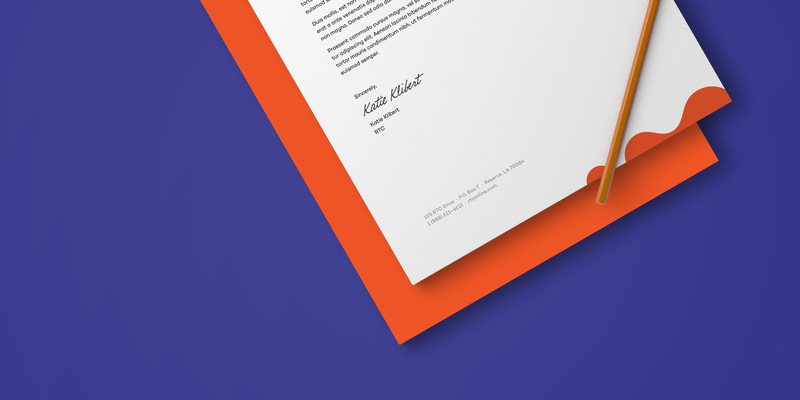 The final design is a simple, easy-to-use system with friendly details sprinkled throughout. 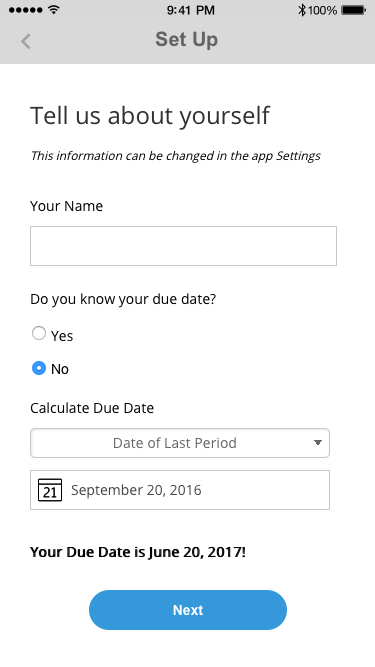 Users can easily find pertinent information relating to where they are at in their pregnancy journey as well as document important milestones along the way.